It’s really important to “age” the egg whites in this recipe. Otherwise, you’ll get flat, crispy wafers, rather than the chewy consistency that makes these seem like real cookies. Aging means simply letting them sit out at room temperature for a while. If you don’t have a pastry bag, use the corner of a plastic bag to pipe the batter onto cookie sheets. The recipe comes from Deb Perelman who writes the Smitten Kitchen blog and just published her first cookbook, named after the blog. This recipe makes two dozen sandwiches. Preheat oven to 300̊F and place racks in the upper and lower thirds of your oven. Line two large sheet pans with parchment paper. Pulse almond paste, sugar and salt in a food processor until broken up, then add egg whites and puree until thick and creamy. Transfer batter to pastry bag fitted with a 3/8-inch tip and pipe 3/4-inch rounds (1/3 inch high) about 1-inch apart in pans. Bake, rotating and switching position of pans halfway through, until golden and puffed, 15 minutes. Cookies will spread and puff up. Let cookies cool almost completely in their pans. Once cool, they’re much easier to cleanly remove from the parchment. 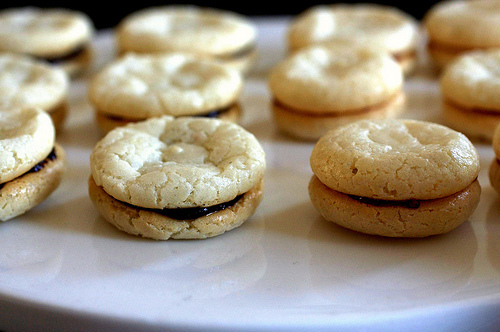 You can make them into sandwich cookies but spreading some jam between them or ganache (3 ounces of semi-sweet chips melted with 1 to 2 tablespoons of cream, then left to thicken a bit would be enough to sandwich the whole batch). Place all ingredients in a bowl and mix until well combined. Store refrigerated and tightly wrapped. This entry was posted in Desserts, Vegetarian and tagged almond, almond paste, egg whites, gluten free. Bookmark the permalink.